Bring a Veteran With You! VULCAN 1700 VAQUERO $9000.00, Best Reasonable Offer Will Talk. 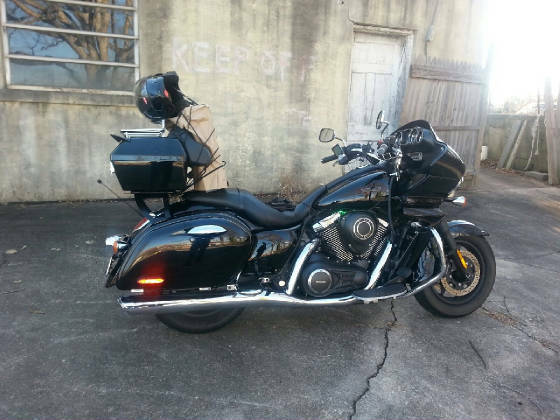 2011 Purchased in 2012 "NEW"Kawasaki VN1700 Dressed. Has a NEW Factory Replaced Motor Done Under Warranty has only 4098 Miles on NEW Motor Original Motor had Factory Defect Kawasaki Replaced at Their cost. Touring Pack, Passing Lights, Power Port for Phone charger, Gell Cell Battery, New Gell seat, Klock Werks Windshield, Vance & Hines pipes with Cobra POWRPRO Fi2000. Title Clear, Bill of Sale will be Written at Time of Purchase. Bike Runs excellent This is a Must See! Contact Me 276.806.6316. NO TEST RIDES ALLOWED and NO SHIPPING PICKUP IN PERSON ONLY! If You See Me Blow Your Horn! I Ride All The Time!